My father, Alfred (Fred) Stride is a subscriber to your magazine and enjoys it very much. 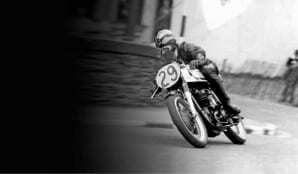 He was active racing back in the 1950s in various classes, he had a Douglas 250, an Itom 50, Manx Norton and an AJS 7R to name a few I can remember. He obviously wishes he still had some of the bikes! I am contacting you as I would like to find out more about this photograph of my father. He is 84 now and can’t even remember the year it was taken. We think it may have been taken in 1954-55? Location was the Isle of Man. Would anyone know the corner? The helmet he is wearing has a large letter P on the front which is the initial of my mother Pauline; he was dating her at the time before their marriage. They have now been married for more than 57 years. He has many great memories from his racing days particularly when on one day John Surtees overtook him around the outside at Brands Hatch in the wet. He thought he was riding really well up until that point!